Description: Spanish Hitching is a unique way to cover thick dowels and other tube shaped objects. You can also cover wine bottles and drinking glasses with this technique. 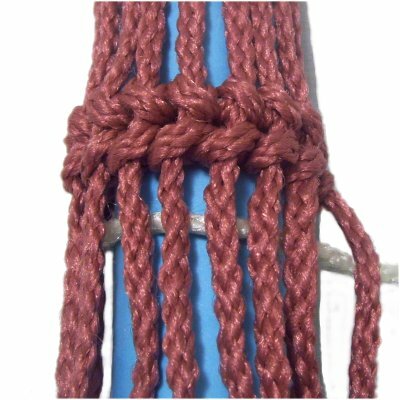 This Macrame design features the Clove Hitch, which is the same as the back of a Double Half Hitch. So you see the crossed elements rather than a bar. 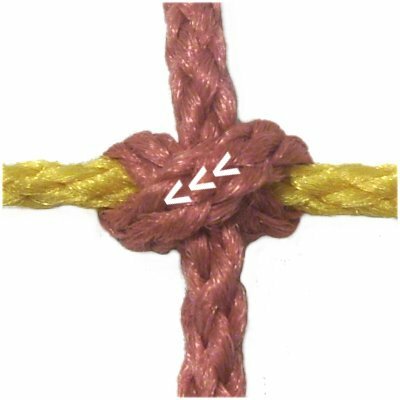 The knots are tied alternating in two directions. 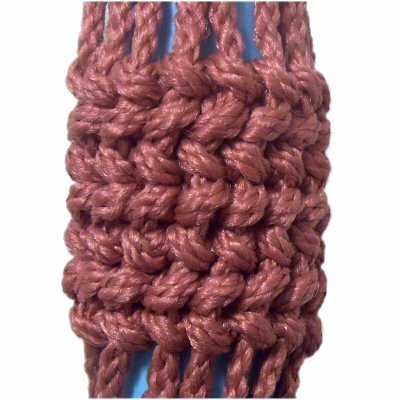 Since the knots used in this design are hitches, they need to be attached to a holding cord, which wraps around the item you are covering. 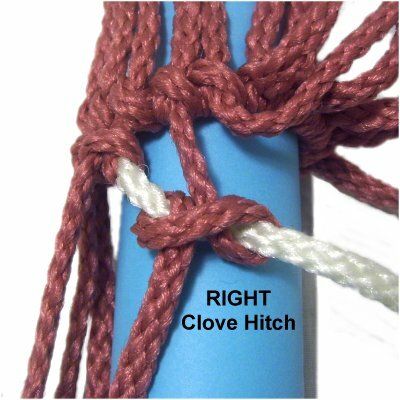 To properly create Spanish Hitching, you need to know how to tie the Clove Hitch in both directions. The first one you will learn is the RIGHT Clove Hitch. The first loop is on the right, followed by the one on the left. Secure a holding cord to your board horizontally, with tension. That's the gold cord in the images shown. 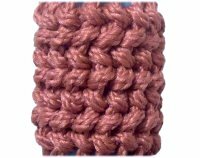 Secure a working cord vertically to your board (rose color in images). Right Loop: Move the working cord over - under the holding cord, rotating counter-clockwise. Complete the loop by passing it over the secured portion of the working cord, as you pull it to the left. 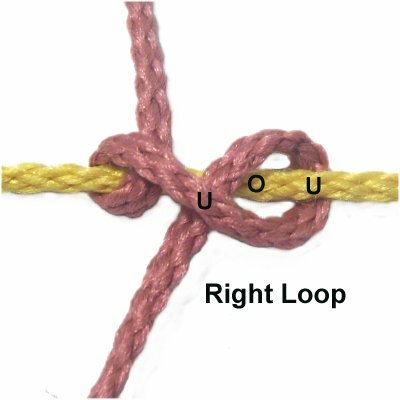 Left Loop: Pass the working cord under - over the holding cord, rotating clockwise. 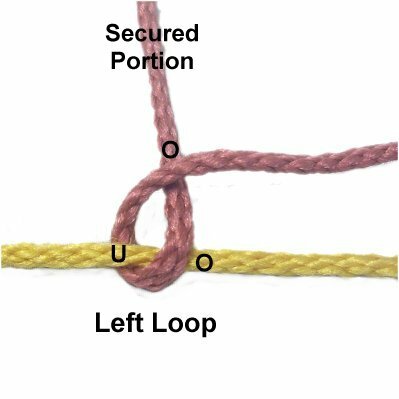 Complete the loop by passing it under the diagonal segment of the working cord, between the two loops. 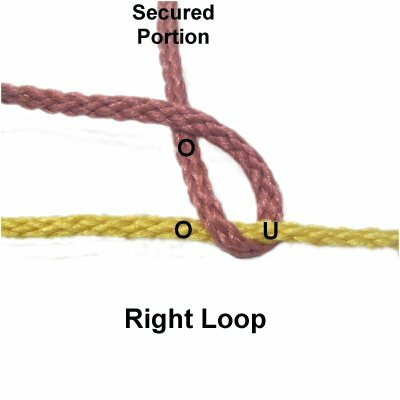 The best way to tighten the knots in Spanish Hitching is to pull up on the diagonal segment in the center area. That will tighten the first loop. Then pull on the working end to tighten the second loop. Slide the second loop close to to the first one. 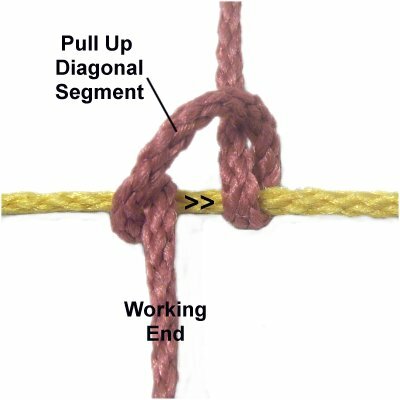 This image shows the diagonal area in the center of the RIGHT Clove Hitch. It runs from upper right to lower left (arrows). 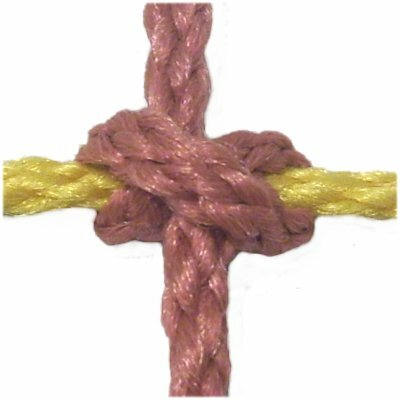 In Spanish Hitching, you alternate the direction you tie the knots. 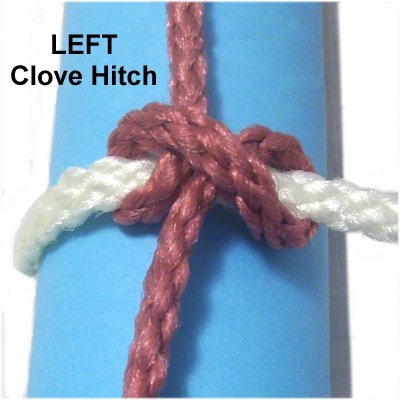 So now you will learn to tie LEFT Clove Hitches. 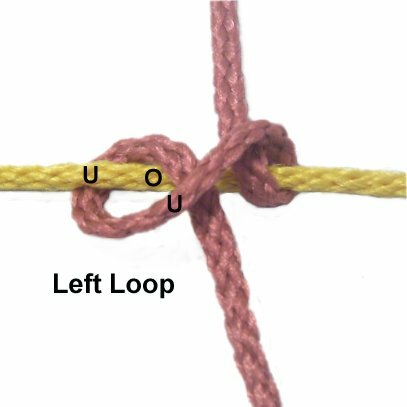 Left Loop: Pass the working cord over - under the holding cord, rotating clockwise. Complete the loop by passing it over the secured portion of the working cord, as you pull it to the right. Right Loop: Move the working cord under - over the holding cord, rotating counter-clockwise. Tighten the Clove Hitch by pulling on the center area to tighten the first loop. Then pull on the working end to tighten the second loop. The diagonal segment starts on the upper right, and down to the lower left (arrows). Now it's time to work on the actual Spanish Hitching design. Note that these instructions are for practicing only. 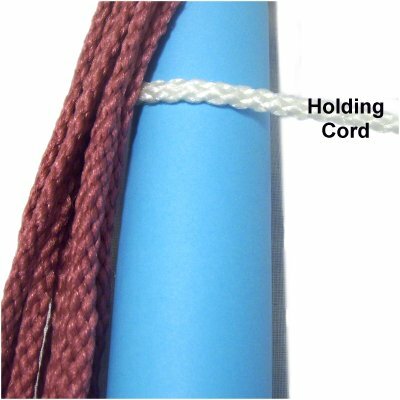 The length of the working cords is the same as what you would normally need, which is 3.5 x the length you are making (top to bottom). Double that if you are folding the cords when you mount them to the item being covered. Step 1: To practice, cut at least 10 working cords, each 30 inches long. You may need more, depending on the tube size. Cut one holding cord, at least 36 inches long. In the images below, that's the white cord. Secure the holding cord to the back of a paper tube. It should start out vertical. Curve it horizontally when you are ready to begin. Use tape or a rubber band to secure the working cords to the top of the tube, so they are vertical. Spread them out so they will cover the entire tube. Bring the holding cord around to the front of the tube (left to right), under the working cords. You can secure it, or hold it in one hand while tying the knots with the other hand. The first row of knots should be as close to the top as possible. Step 2: Tie a LEFT Clove Hitch with each working cord, onto the holding cord. 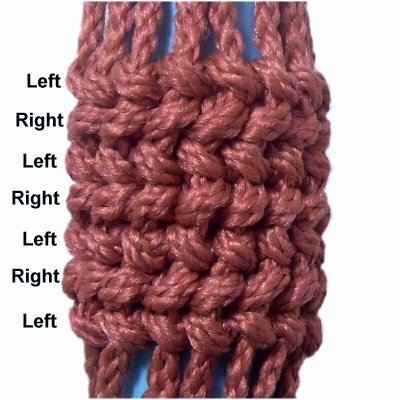 Keep the holding cord horizontal as you tighten each knot. Step 3: When you get to the back, pass the holding cord around the secured tail once or twice, then bring it back to the front of the tube in preparation for the next row. You can pull the holding cord to remove the slack, if the knots have gaps between them. This shows what the first row of Clove Hitches will look like when you are through. Make sure the row is straight, so the Spanish Hitching looks neat. Step 4: Wrap the holding cord around the tube, passing under the working cords close to the first row. Attach each of the working cords to it with a RIGHT Clove Hitch, moving left to right. See tip below. Designer's Tip: Because you are moving left to right, it gets awkward to tie the right Clove Hitches. The best solution is to tie the knot loosely with the holding cord arranged diagonally, as shown in the image above. Then bring the holding cord up to rest close to the first row, and arrange it horizontally. Tighten the knot by pulling up the diagonal segment in the center, followed by the working end. 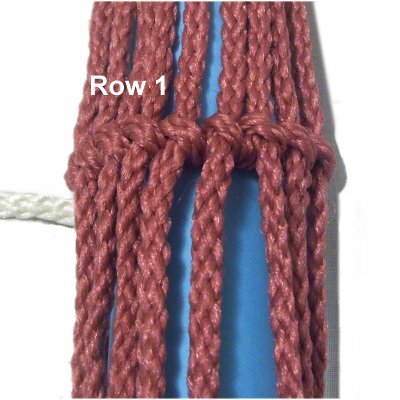 By tightening in this manner, the two rows will be close together, which is an important part of Spanish Hitching. To continue, wrap the holding cord around, and tie the 3rd row with left Clove Hitches. The 4th row is tied with right Clove Hitches. Just keep alternating if you wish to make more rows. Have any comments about Spanish Hitching? Contact Me.